Learn more at VAMeter.com ! We completed our first Volume X study in 2003, and published subsequent editions in 2008, 2010, 2013 and 2015. We have closely followed the growth in the markets of all the flowmeter types during this time. The main goal of this study is to determine the size of the worldwide flowmeter market, including all technologies, and to see if the trend towards new technology flowmeters continues. This study contains revenue, unit, and average selling price data for all flow technologies, segmented by region. It provides the tools you need to compare market size, market shares, and growth rates for all the flow technologies. It also provides product analysis and growth factors for each flowmeter type. Volume X enables you to assess your competitive position in the flowmeters you supply and the ones you compete against. Market forecasts through 2020 are included. For segmentation breakouts, see the Overview above. 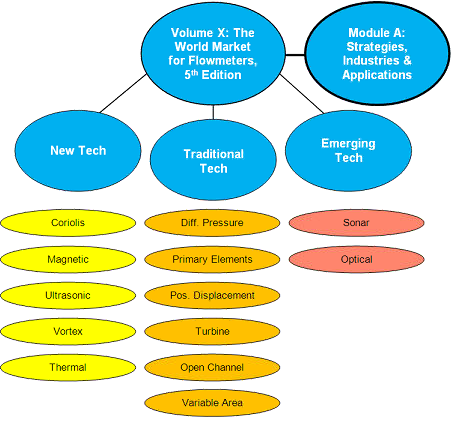 The in-depth reserarch in Module A: Strategies, Industries, & Applications complements and builds on the results of Volume X: The World Market for Flowmeters, 6th Edition. The module can be ordered as a standalone report or as an add-on to the main study. Most variable area (VA) flowmeters consist of a tapered tube that contains a float. The upward force of the fluid is counterbalanced by the force of gravity. The point at which the float stays constant indicates the volumetric flowrate, which can be often read on a scale on the meter tube. VA meter tubes are made of metal, glass, and plastic. Metal tubes are the most expensive type, while the plastic tubes are lower in cost. Metal tubes are used for high-pressure applications. While most VA meters can be read manually, some also contain transmitters that generate an output signal that can be sent to a controller or recorder. While VA meters should not be selected when high accuracy is a requirement, they do very well when a visual indication of flow is sufficient. They are very effective at measuring low flowrates, and can also serve as flow/no-flow indicators. VA meters do not require electric power, and can safely be used in flammable environments. One important development for variable area flowmeters is the development of meters with a transmitter output. The HART protocol is available on some meters. This turns the VA meter into more than a visual indicator, and makes it possible to do control and recording. A class of VA meters called purgemeters have been developed to handle a variety of low flow applications. Other areas of research include float design and materials of tube construction, especially metal.